Our pigs are Tamworth and Saddleback first crosses – we find this provides a good mix of the hardy slow growing flavoursome Tamworth; a pig which is full of character and a joy to own, and the Saddleback cross ensure a good sized but lean pig with a docile temperament. The Tamworths are an engaging and talkative ginger pig, reknowned for being a great ‘dual purpose’ pig producing good pork as well as excellent bacon. Having a long snout it is also of great use to anyone who has a piece of rough overgrown land that needs clearing, and will earn its keep as a professional rotavator! British Saddlebacks are hardy and noted for their mothering ability, they are black with a white belt across the shoulders and lop ears. The breed often used to provide coloured dams for the production of first-cross porkers, baconers and heavy pigs. The breed is known for its grazing ability, quiet temperament and is very hardy as a result it is popular in both outdoor and organic production. Our pigs arrive from a local breeder at 8 weeks of age when they are fully weaned, they are sociable animals and like to be kept in small groups with plenty of space to forage. They go straight outside into grass paddocks and immediately start rooting around and digging over the ground foraging for natural food. Most of what they forage is grass, roots and leaves. But they also eat worms, grubs, roots, acorns, berries and fruits their diet is about the same as a grass-fed chicken and is supplemented by grain based pellets to ensure their nutritional needs are met. Our pigs are provided with straw bedded shelters they can use for protection from inclement weather or protection from the sun, in addition to fresh drinking water they are provided with deep water wallows to cool off during hot summer days. 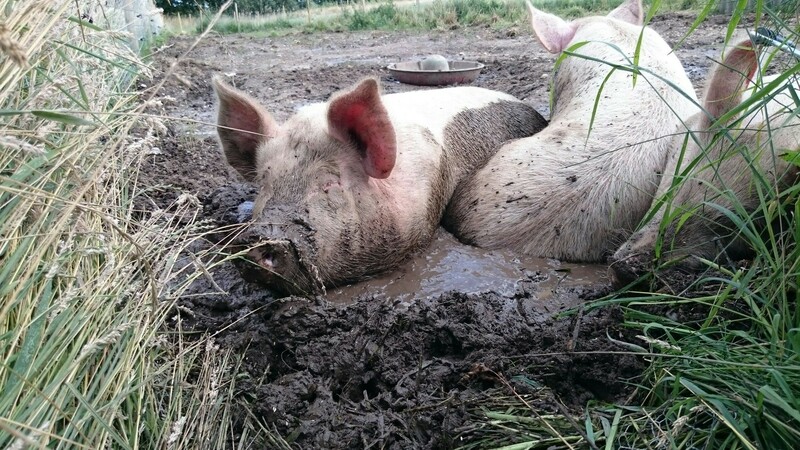 A happy pig is allowed to socialise within its herd, have space to roam and grow at its natural pace. See our welfare page for more information about how we care for our livestock and if you are interested in finding out more about trying a some of our sausages, and joints see our produce pages or visit the shop.